In 1917, a critical year in the First World War, socialists of various national and political backgrounds planned to gather in a neutral country for a peace conference to show the way to permanent world peace. There was a great deal of attention for this attempt at informal diplomacy, but governments generally viewed it with distrust. The conference never took place, but at least the intention made thoughts about peace more concrete and timely. 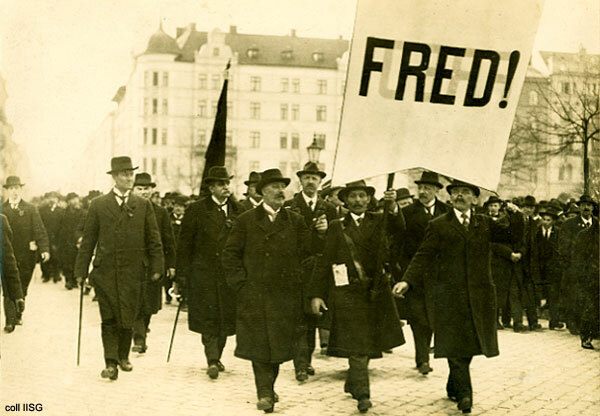 The efforts of international Social democrats to organize the 1917 Stockholm Peace Conference were put on record. The efforts can be found in various archives. Dr Martin Grass of the Swedish Arbetarrörelsens Arkiv och Bibliotek [Labour History Archive and Library] has brought together press communiqués, minutes of meetings, and other documents from the Dutch-Scandinavian organizing committee and the delegations that came to Stockholm from all over the world to plead their case. Together they paint a picture of high aspirations that collided with power politics and national interests. In this archive are 148 documents in their original language, with German translation and annotations, and a selection of photographs from the conference preparations, also annotated in German.